Serious shooters are always looking for M2A1 cans. No more buying rusty, refurbished cans. No more paying a premium for U.S. military production overruns. 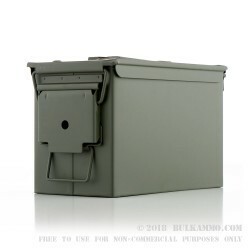 These cans are brand new and they are priced low so that serious shooters like you can finally afford to safe-keep your ammunition and other goods the way it should be done. 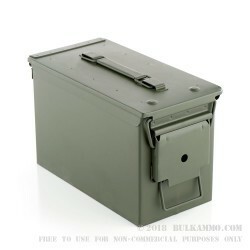 These M2A1 cans are NEW PRODUCTION and can be bought in different configurations ranging from a single can to twelve-can cartons (while supplies last). 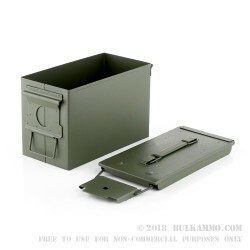 They’re made the same size and with the same steel box/lid, rubber seal, olive drab powder coating, and steel handles as mil-spec M2A1 cans, but they were manufactured in China to keep the price low. If you have a lot of ammunition stacked up in your basement, garage, or safe, you should consider trying these cans. They’re rugged, they last forever, and they’ve been used by the U.S. military for half a century. 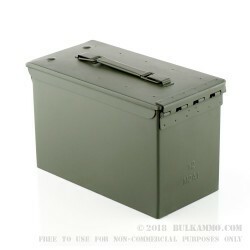 A bargain for the compartmentalized, storage fiend who needs “just one more” M2A1 ammunition can. This is the standard by which all ammunition cans are judged in the current market. 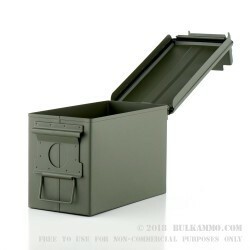 It is a premium, brand new quality mil-specification product that is built with longevity in mind. The design is definitely function over form, but there is something elegant almost, about the utility and value that is brought on by the O.D. Green paint and the timeless design including the stocky, heavy duty design that is built for legitimate usage. This is a standard sized 50 caliber can that approximately measures: 12 inches long by just over 6 inches wide by 7.5 inches high. 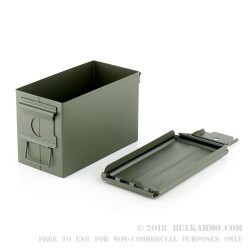 The handle is built to “handle” heavy loads and the lid seals out moisture and provides a weathertight seal to protect contents. 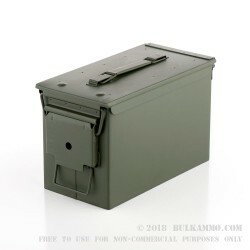 This can is perfect for long-term storage of anything that fits inside, but it is obviously very good at keep the ammunition you buy in a good working condition without being super expensive or complicated. The durability of these cans is legendary. 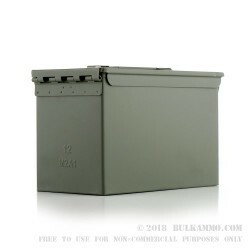 This 12 pack helps those who have a lot of storage needs or for those who just know they will be buying more in the future. The associated price is excellent too, for new manufactured cans.